It’s been taking rather a long time to sort out the problem with my fixie forks, and whilst I was riding it for a while the reaction of a mechanic in a local bike shop gave me pause for thought (he went pale, looked at me and simply said ‘Well, I wouldn’t ride it, not even to go up the street. That fork could collapse at any moment!’). So it’s been in the garage for a few weeks whilst replacement forks are organised. However, the time came earlier in the week to take it into the shop for treatment to commence. Initially I just thought I’d ride it in, but the mechanic’s words were still ringing in my ears, so I hesitated. But perhaps there was another way? I’ve carried a lot of things on the Radish over the past few years, but to date I’ve struggled to find a way to transport a road bike. I’ve managed a fold-up bike, but fitting a full sized bike on the back to date has foxed me. However, necessity is the mother of invention (as they say), and as I considered my predicament (including the horrible possibility that I might have to drive to the bike shop – uggh!) 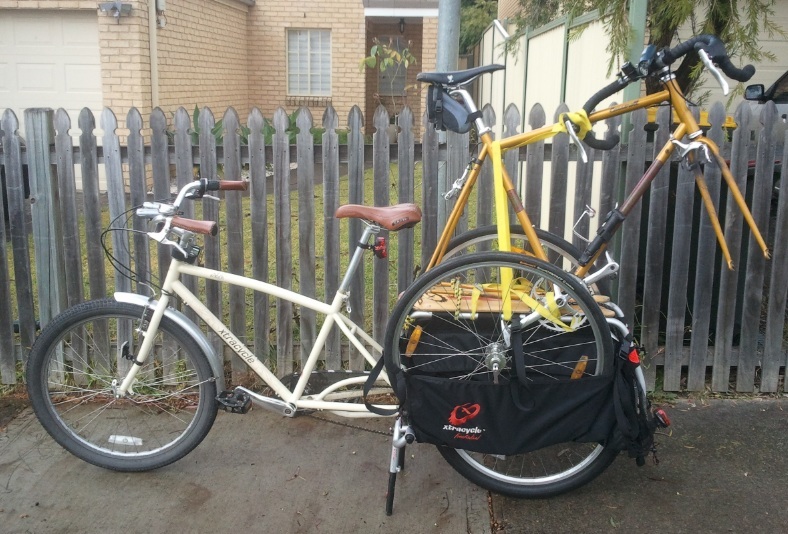 a possible way of getting the fixie onto the back of the cargo bike suggested itself. So I set too; taking the wheels off and strapping the frame upright on the cargo deck with an impressive array of straps and bungee cords. The wheels (just) fitted into the side panniers, and I was ready to go! I got a few strange looks as I pedalled along – although secretly I have to admit rather fewer than I was hoping for. The funniest thing was that I kept catching sight of the fixie handlebars out of my peripheral vision, and thinking there was another cyclist right up on my left. The cargo bike handled admirably, as it always does under load, with only the slightest hint of instability from the high weight distribution. Riding along with a slightly precarious cargo certainly brings home just how poor so many of Sydney’s bike routes are, especially the ‘shared pavement’ ones – for example along Victoria Road. Potholes, grooves, curbs and discontinuities in the surface abound. Thankfully my straps held the frame tight, and I had no mishaps even on the bumpy sections. It was a lovely day when I set off for work this morning – a fabulous day for a ride, in fact. It stayed nice all morning, and then in the afternoon the low cloud came in, and it began to rain. Cold, wet, drizzly rain. I had a rehearsal again tonight, so afterwards faced the delights of a fairly long ride home, on the laden Radish, with no waterproofs or even sensible rain clothing – I was wearing cotton pants and a sweater which had already got quite sodden just from the short ride to the rehearsal venue. I set off after rehearsal to the commiserations of my fellow musicians. ‘Don’t envy you tonight!’ they called out, as they got into their cars. And as I set off into the traffic, the cold wind whistling through my clothes and the rain soaking my legs I could see the attraction of a warm car. But no ride is ever really that bad, and I soon started to warm up. And as I reached the Sydney Harbour Bridge, I had real reason to celebrate riding. The low cloud hanging over the city was such that it was obscuring the top of the great arch of the bridge. The lights that illuminate it were casting their glow into the mist, and the structure was clearly visible, lit by an almost ghostly light. The cloud lay over the top, and it looked for all the world like that great bridge was holding up the sky. Really beautiful; I have ridden across that bridge thousands of times, but there are always new surprises. 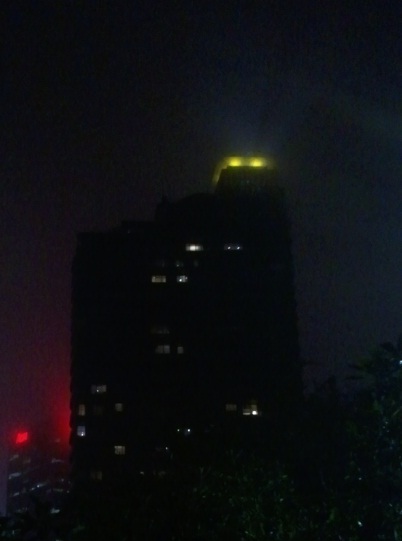 As I approached the CBD, the taller buildings were too pushing up into the cloud, and right in front of me as I rode was an apartment block; a bright yellow light at the top illuminating the mist like some kind of urban lighthouse. Magical, magical stuff. The cold and wet was forgotten as I surveyed the wonderland around me. And who else was enjoying these views? Not the poor people in their cars, that’s for sure; peering through their rain splattered windows, the glare of the streetlights blocking out the view. No, my friends were wrong. They should envy me; this wonderful city is putting on a special show and I am the only one getting to see it. And all because I ride a bicycle. I took a few pictures with my phone, but they don’t really do justice to the views. Still, perhaps you get the idea. When I went down to the parking garage after work to get my bike the other day, I noticed something was missing. Finally! The poor, orphaned Reid hybrid that had been sitting there for months and months had finally gone. At last! Perhaps the owner had finally remembered that they had a bike in the garage, and perhaps also remembered how much fun it was to ride to work, and had pedalled off into the sunset. Or perhaps it was something more sinister. 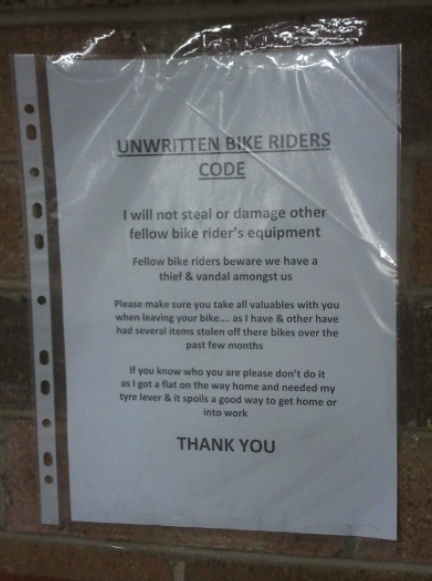 For around the same time, the following notice also went up over the bike racks – the ‘unwritten bike riders code’. ‘Fellow bike riders beware.’ it declaimed in solemn tones. ‘We have a thief and vandal amongst us’. Goodness. It seems some things have gone missing from various bikes. Nothing from mine, I’m pleased to say. Probably because all my stuff is so old, tatty and smelly that no-one wants it. So I hope the poor old Reid did go home with its rightful owner, and has not been spirited away by a Thief And Vandal. Or if it was, I hope the said Thief And Vandal is treating it well and riding it often. Whichever way, it seems it’s not being ridden into work, as since it vanished a few weeks ago I haven’t yet seen it return. Still, it’s handy to have some more space in the bike rack. Here’s a thing. Arnott’s hardly make any biscuits with nuts in. Strange really; you’d think this iconic Australian company would do more to showcase the macadamia nut, Australia’s only native contribution to commercial food crops. But nuts remain absent from most of their range. This is probably a good thing, at least in the Chillikebab household, as Mrs Chillikebab is allergic to nuts. 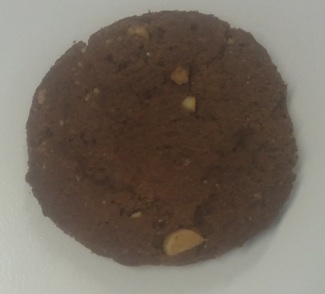 Anyway, this week we look at one of the few in the range that does feature nuts – the Peanut Brownie Cookie. This is the third in the trio of ‘Homebake’ cookie range, the others being ‘Chocolate Chip’ and ‘Chocolate Chip Fudge’. They present just like the others in the range; in a large bag, covered in a dusting of crumbs. They are a bit darker than the others in the range, but otherwise look very similar. Large pieces of peanut are not in evidence – what peanut there has been chopped into small pieces. Now, when I think of brownies I think of something decadent, moreish and – most importantly – soft and squidgy. 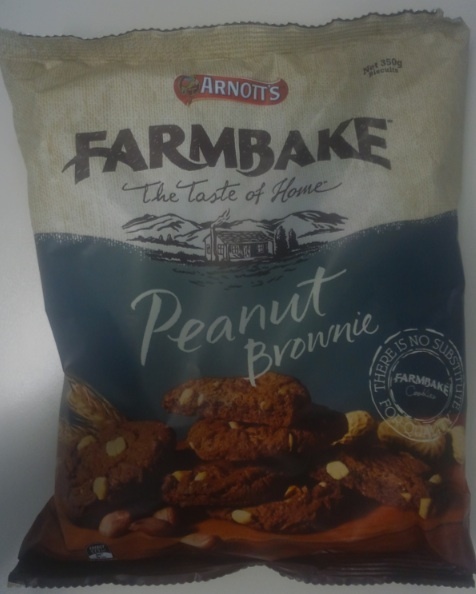 So I was interested to see how Arnott’s would incorporate this essence of brownie-ness into these biscuits. I’m sad to report that the answer to that question is ‘they don’t’. These biscuits have exactly the same crunchy texture as the Chocolate Chip Cookie variety. They do have a chocolately taste, but without the chocolate chips of the original this is somewhat understated. And the peanuts really don’t do much – they are close to undetectable, which is a pity. So these biscuits don’t really deliver on the promise. They are quite OK, and pleasant enough, but seeing as they lack both ‘brownie’ and ‘peanut’ characteristics, it’s hard to rate them really highly. On balance, probably better to stick with the regular Choc Chip variety. I’ll give these a six out of ten. 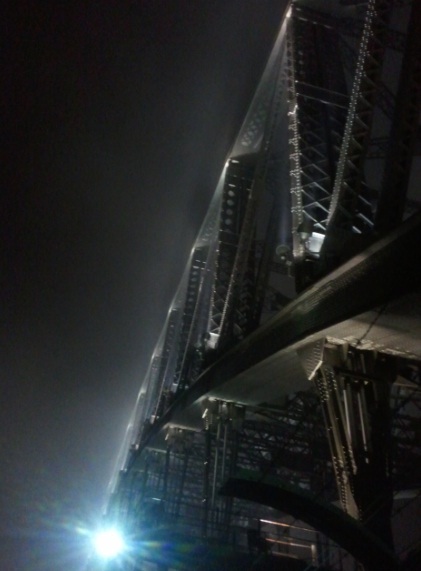 I happened to be riding north over the Sydney Harbour Bridge tonight. I was on my way to an orchestra rehearsal, so was on the Radish, all loaded up with viola and other musical accoutrements. It was dark, so I of course had my lights on, and I was also wearing a reflective sash – in part because it was cold, and the only warm top I had with me was black. Wearing black when riding at night never strikes me as ideal (I try to wear light colours if I can), but if I have to sticking on some reflective stuff hopefully makes up for it. As I was cruising along, it so happened that Mrs Chillikebab called me. So I pulled out my phone and chatted to her as I cruised along, nice and slow. Now, cycling whilst using the phone. Irresponsible? Foolhardy? Not really advisable? Perfectly fine? Whilst it’s probably not ideal, when riding slowly on a dedicated cycle way where there are no side turnings and no traffic doesn’t strike me as especially foolhardy, although I suppose others may disagree. Feel free to let rip in the comments below. As I cruised along, another cyclist few past me, and as he so he called out something. I missed what he said as he hurtled past, but I did note that, like me, he was wearing black. He also had a black bike, no reflectors and no rear lights. A ninja cyclist! I caught up with him at the steps at the northern end, and asked him what he had called out to me. “Mate!’, he said, ‘Get a helmet! It’s dangerous! Talking on the phone, no helmet – it’s dangerous! You’ll be killed!’. I was about to ask hm whether he always used a helmet when he used his phone, but instead pointed out that he had no lights, and was wearing all black. ‘That seems a lot more dangerous to me,’ I commented. He turned it on, and then rode off, shouting back over his shoulder to me as he went through a red light, ‘It’s for your own safety! It’s dangerous! Get a helmet!’. It really is terrifically sad. So may Australians do seem to believe that riding a bicycle without a helmet is suicidal. Do they really think that a centimetre of polystyrene is going to help them that much? Goodness, if it’s that dangerous, best not ride a bike at all. And why the need to tell people all the time? I’ve no doubt his concern for my well being was genuine, but does he also go up to smokers and lecture them on the dangers of tobacco? Bizarrely, it’s always on the Harbour Bridge that I seem to get those comments; invariably from cyclists doing something I consider a bit ill-advised, if not actually outright dangerous. On several occasions I’ve had it shouted to me by cyclists whizzing too fast out of the arch on the southern side in the middle of the path as they nearly collide with me, for example. Anyway, you can rest easy if you’re reading this, ninja cyclist. I’ve spent a lot of time looking into this, and have come to the conclusion that wearing a helmet is more risky than not wearing one. It’s based on science (go and look up rotational brain injuries, driver behaviour and risk compensation, if you fancy some light reading) and my own experiences of riding helmeted and without one. But that’s OK. I won’t lecture you on your choices either, even if you decide to continue wearing one. I’ve been working on this for years. It’s something I wanted to be able to do – but not enough such that I went out to practise for hours until I could do it. 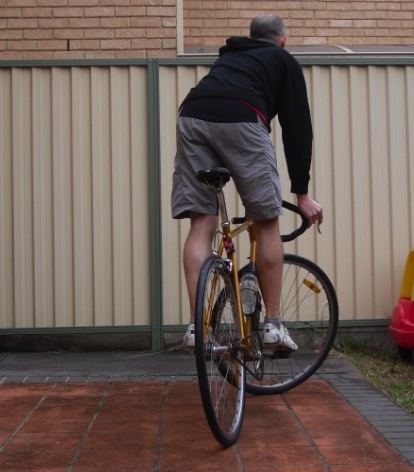 However, I’ve been gradually getting better, and I think I am now good enough to be able announce <drumroll> that I can at last do a trackstand. I’m not brilliant, and certainly can’t do all the no-handed, sitting down things of the real masters. Neither can I match the nonchalant way those really good at it chat to each other as they wait – it still takes so much concentration that any attempt at speaking invariably results in me losing my balance. However, for the most part I can now draw up at a red traffic light, and then stay pretty much motionless (with just a little frantic rocking too and fro) until the light goes green – even if I have to wait most of the phase. I don’t know why, but there’s something childishly pleasing about not having to put your foot down when you stop. And I have noticed that my cleats are wearing out less quickly (although the fact that my commute no longer takes me up the SHB steps is I think a more pertinent reason). Of course, I can only do this on the fixie. I’ve yet to manage anything close to balancing on the cargo bike. Although I’d like to be able to; I think that would be very cool – especially if it was loaded up. I suspect that many of my readers have now added ‘poseur’ to the list of my characteristics. Or perhaps something else less printable. Whatever. Somewhere, deep down, you have to admit that you’d like to be able to do it too.